Consider going wireless when planning a home theater. Setting up a wireless home theater has two big advantages: neatness (say bye-bye to the tangle of cables) and flexibility (move the system to a different room or a different city!). 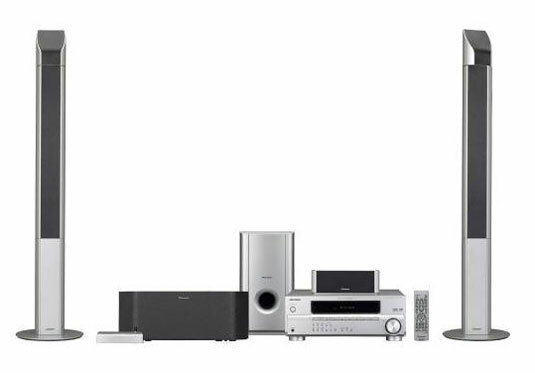 A number of manufacturers are now shipping home theater speaker systems (or home-theater-in-a-box — HTIB — systems that included the speakers, receiver, and DVD player all in one package) with wireless surround speakers. Although the wireless connection may be built into the receiver and speakers, more often systems are sold as wireless ready, which means you buy an extra module or two (the wireless transmitter and receiver) and plug them into your receiver (the transmitter) and speakers (the receiver). Another thing to keep in mind is that even though you won’t need speaker wires running to the back of the room with wireless surrounds, you will need power — both to run the wireless receiver and also to provide amplification to the surround speakers (there’s usually an amplifier built into the wireless receiver module or into the wireless surround speakers themselves). So you’re not going to be truly wireless, just front-of-the-room-to-back-of-the-room wireless. Wireless is getting a lot of attention from home theater engineers and designers, and wireless technologies themselves are advancing rapidly. Over time, wireless will be a natural part of many home theaters. Today it’s a niche product for people with specific needs and requirements. Although wireless systems work just fine, keep in mind that if you’re looking for a truly high-fidelity surround-sound experience, wires are always going to be better.